- it is a movie DVD. Interested in finding out more about Neurotypical? Join the live online Q & A with the film's director, Adam Larsen, at 20.00 BST on Thursday 12 April. 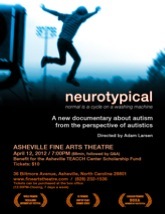 To receive a password, register at the Autism Film Club. To view the film, all you will need to do is type in the Autism Film Club password into the video box, when the film is available, and start watching at a time that suits you - you can pause, fast forward and rewind as much as you like.